If you like dim sum, you’ll love these chicken and pork dumplings from Sunshine on a Plate. Ready-made dumpling wrappers make this recipe easy and achievable.These are very much like dim sum; another Mauritian dish with Chinese origins. Usually they would be eaten before Min Frire or Pork Bol Renversé. These may sound complex but if you buy ready-made dumpling wrappers, it’s really a very simple dish, which I guarantee you will absolutely love. ​A hot and messy savoury snack perfect for diving in, a shameless party finger food. 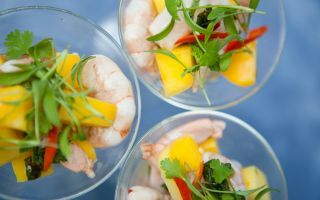 ​I just love this combination of fiery prawns with a soothing cucumber relish, so easy to put together and perfect for entertaining friends in the summer months. As featured in Sainsbury’s magazine. Baked tofu has a firmer texture and holds its shape better when tossed through a salad. This is deceiving as it is packed with loads of flavour, be liberal with the chilli and lemon as it really lifts this super fragrant dish. ​Delicious twist on a classic fish burger served with a sharp and tangy tzaziki with a hum of beautiful spice running through all of it. Rougaille is a classic Creole sauce which gives its name to many Mauritian dishes; it looks like a simple tomato sauce but is so much more. It has a huge depth of flavour thanks to the European herbs parsley and thyme, the heat provided by the chilli and the Indian flavourings of ginger, coriander and garlic. At the end of the week I always end up with a umber of nearly off bananas! I decided to add some spice and turn it into something really delicious. This crisp, summery salad with fresh lobster makes a delicious summer lunch or posh picnic. I made up this dish from some leftover feta and sweetcorn I had in the fridge - my girls were coming over in the evening and it was a quick starter which they loved. These burgers can be made in less than 15 minutes and are packed full of flavour. This recipe is very refreshing and zesty, it’s so easy to make and perfect for a dinner party as you can make it the day before. This is a Mauritian inspired recipe. These cookies are deliciously sweet as they use Billington’s sugar. ​Perfect for alfresco dining as part of a cheeseboard or tapas selection. What’s not to love - by far my favourite aperitivo snack with cold beer ! These cute little bhajis are perfect for parties and use rice noodles and chicken as a good alternative to onion. These deliciously spicy gateau piment are best served hot and are perfect with a crisp beer like Pheonix. If you can’t get hold of this beer then it would work equally well with something like Asahi. Bon Appetit!